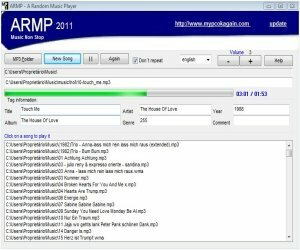 ARMP (FREEWARE version 2011) Music non stop, play all your mp3 collection , random Mp3 player that allows you to listen your favorite music without having to worry about anything. Just tell the program where the songs are located in your computer and it will play them randomly. You can also be the DJ and at any time select a music on mp3 list playing it. 8 idioms. Small program that uses few system resources. ...... 8 idioms. ARMP - A Random Music Player is small program that uses few system resources. -> Easy to use, small size. ZRandom for Excel. Better RNG. 16 distributions, use from Excel, VBA or menu. Makes your PC become an iPod Shuffle! It is a proprietary cross-platform media player that plays multimedia formats. Qweas is providing links to ARMP - A Random Music Player 2011 as a courtesy, and makes no representations regarding ARMP - A Random Music Player or any other applications or any information related thereto. Any questions, complaints or claims regarding this application ARMP - A Random Music Player 2011 must be directed to the appropriate software vendor. You may click the publisher link of ARMP - A Random Music Player on the top of this page to get more details about the vendor.